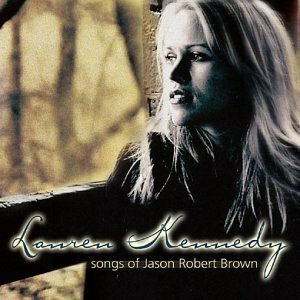 After her astonishing performance as Cathy in the world premiere of “The Last Five Years” in Chicago in 2001, Lauren Kennedy collaborated with JRB on this album featuring several songs never heard before as well as new arrangements of songs from all three of JRB’s shows. But don't ask me this. What's there to risk? Why is the course unclear? And you will lead me there. See how I keep my vow? Don’t ya think that’s pretty music? Those fellas sure can play. It’s a cryin’ shame these folks ain’t dancin’. Always makes a better day. So you had to let your baby go? Sittin’ next to me, just proves you never know. Yes indeed, that’s pretty music. Maybe we got something else in common. If they play it slow and sweet. Maybe I could show you how it goes. Maybe you could promise not to break my toes. I knew I had a method to make you smile! I knew you been blue for a good long while! Looks like we’re stuck here together! You’re light as a feather, I’m deep in denial! So don’tcha stop that pretty music! Sure makes me feel alive! Who cares what all these losers say? But look at what’s standin’ in front of you! And let the music play! Letting you go away from me. Or would you go away? And like a shot, she and Mitchell got married that summer. While Mitchell’s out ev’ry night, being a heavy-metal drummer. Mitchell got a job at a record store in the mall. Got a room, got a cat, and got twenty pounds thinner. He wouldn’t leave me alone ‘less I went with him to dinner. I gave up my life for the better part of a year. I don’t want you to throw up all your walls and defenses. I will never go back, never look back anymore. And it feels like my life led right to your side and will keep me there from now on. Say you’ll move in with me. I had a house while you were gone. It was better without you. I'd give it all for you by my side once more. Was you to fight the fear. I took a trip while I was gone. I was better without you. And dreams just don't come true. And harder to blindly trust what you can't understand. And harder to stand and fight for the things you believe. But when Paradise calls me, I'd rather be here. I knew where I needed to be! Oh, I gave it all for you! I gave it all for you by my side once more. Oh, I gave it all for you. The things that are dearer. And hope that, for a while, you'll stay. And banish any trace of gray! When fin'lly you come home to me. So proud to call you mine! Land in a puddle at your feet. Watch how the wind is rushing through me. Look how the winter turns to spring. Who knows what else my heart might bring? This is how the eyes of the world are opened. Don't kiss me goodbye again. Leave this night clean and quiet. But leave it for now. Was wrapped up inside that one perfect kiss. I stand on a precipice. I struggle to keep my balance. I open myself one stitch at a time. Finally something takes me away. For I have been waiting! Could you bear to look at me? Would you smile with understanding? Would you burn with disappointment? Would you turn and turn me out? Or push away the tide. Or would I get extra points because I tried? If I told you now? And I'll be flying home. Speak my name and I'll rise into the sky. And I'll taste the Heavens! And my shame and my fear will pass me by. Say the word, and I'll lift into the air! And I am flying home! Carry me on, carry me on. Carry me on, carry me on!